July and August are tomato time here in Western North Carolina! The farm markets are crowing about the lovely boxes of heirloom tomatoes available for purchase, and the volunteer tomato vines left behind in our empty chicken coop are giving me handfuls of sweet cherry tomatoes every day. As awesome as a fresh tomato can be, there’s only so many BLTs a person can stand (or so I’m told). 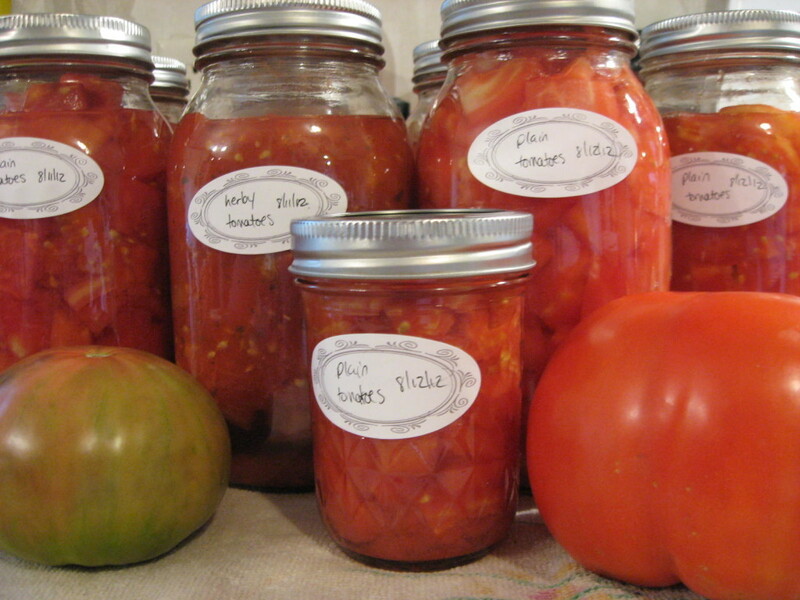 If you want to preserve that fresh flavor for winter months, you can always can your tomato harvest. Be prepared to be warm! Canning produce involves a lot of heat in the form of boiling water, so enjoy your steam baths along with the lovely jars of red jewels you end up with. Lovely jars of lovely tomatoes for lovely dinners to come! Here is my step by step guide on how to can tomatoes using the water bath method. Get Tomatoes: You can use your own bountiful harvest, or that of your neighbor with too many plants, or grab a box of fresh ‘maters from your local farm market! In general, seven large tomatoes will fill a one-quart jar. Heavy, low-moisture tomatoes like Roma hold up the best, but as you can see from the images I’ve shared, Heirloom tomatoes preserve beautifully as well, if a bit watery. Lids and Rings: Do NOT reuse old jar lids. Go out and buy a pack of new lids. You can reuse the rings and jars, but it is not safe to reuse the inner lids. 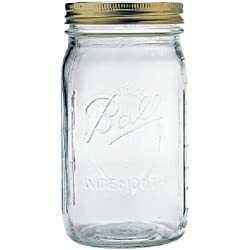 Canning Pot: You need a pot large enough to submerge your chosen size of jars under at least one inch of water, plus room for the boiling water to bubble. If you have a canning pot with a rack, wonderful! 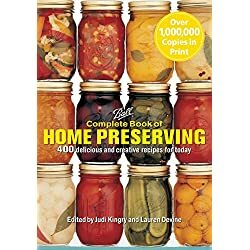 I do not, so I tend to use a big pot with a dish towel or two set on the bottom of the pot to provide a cushion for the jars while they are processing. Tongs or Jar Lifter: A jar lifter is worth the bit of expense, as tongs can be slippery to handle with heavy jars. The only burns I’ve given myself while canning was from using tongs to lift the boiling hot jars from the pot. Small pan: You will simmer the new lids in this pot to sanitize them. Bowl of ice water: For shocking the tomato skins off. Kettle: For the hot water to fill the jars. Jar Funnel: I highly encourage the use of one of these…otherwise, it can be a huge mess! Ladles and Spoons: Long-handled tools are great to have on hand. Lemon Juice: This is required to increase the acidity, and you won’t taste it at all! It also helps the tomatoes to retain their color and flavor. Once you have all of your equipment together to can tomatoes, you get to start the work! If you have a dishwasher, you can sanitize your jars by running them through a wash cycle, with the water temperature set extra high. If you do not have a dishwasher, rinse the jars and then fill your sink with boiling water, submerge the jars completely, and leave until ready to use. Start the Canning pot. Fill it about halfway, put the lid on, and let it begin to heat. Start the Kettle heating. This will be to fill the jars later on. Boil the lids in the small pan for about five minutes, then turn down to low heat. Allow them to rest in the hot water until needed. Remove the Tomato Skins. Wash your tomatoes and set up the bowl of ice water. While the water is coming to a boil, use a sharp knife to cut a small X in the bottom of each tomato for easier peeling. You can also cut out the stem spot if you wish. Set the medium pot of water to boil. Once it is at a rolling boil, put a tomato or two carefully into the water. After about 30 seconds, the skin will crack. Use a slotted spoon to remove the tomato and put it into the bowl of ice water. The skin should slide right off! Cutting the Tomatoes (or not). Remove any bruised or icky spots and compost them. Slice, dice, quarter…chop them however you wish, depending on whatever goals you have in mind for these tomatoes. You can also leave them whole if they are small, which is my preference. Some folks remove seeds, but I leave them in. There are now two different options to consider before you proceed: Hot Pack or Cold Pack. 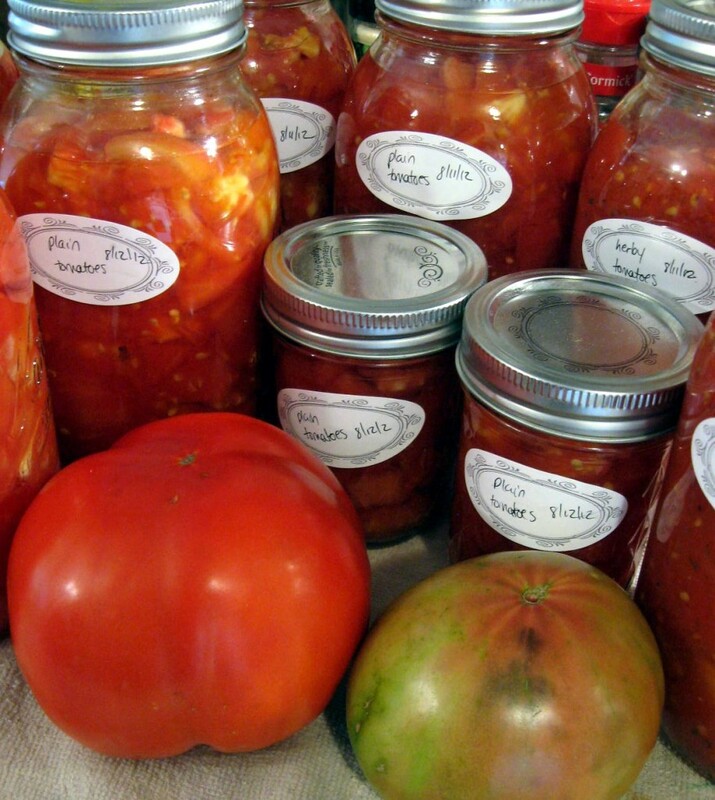 The difference in method mostly has to do with the standards for safety in canning. I have used both methods with no problem, and without a discernible difference in results. Fill the jars: Use the funnel to pour the chopped tomatoes in, and use a wooden spoon to push them down gently to fill the jar up to within 1/4 inch of the top of the jar. Wipe off all contact surfaces to ensure good, clean seals. Add lemon juice: 2 tbsp per quart jar, or 1 tbsp per pint jar. Remove the Bubbles: Use a butter knife, or the handle of a spoon, to carefully move around the edge of the jar. This moves the tomatoes around, ensuring any air bubbles are released. Put on the lids and rings: Wipe down the jars first if needed. Pull a lid carefully from the hot water, put it down on the jar, and snugly screw the ring on. Do NOT tighten all the way. When the water in the canning pot is boiling, carefully add the jars one by one (or in a rack, if you have one). Ensure they are covered with at least 1 inch of water, and keep the boiling going! They should sit in the boiling water for about 40 minutes for pints, and about 50 minutes for quarts. Add more boiling water as needed to keep the water volume above the jars. Lift the jars out of the water VERY CAREFULLY. Try not to let them bump or touch each other, and put them down on a clean dishtowel waiting on the counter. Remove the rings as soon as they are cool, or at least loosen them. Otherwise, they can rust into place. Enjoy the popping of the seals as the jars cool! If you haven’t heard that neat noise before, let me explain. As the jar cools, it pulls down the lid and it will seal with a *pop* – you can test this by gently pressing the center of a lid when the jars are cool. If the center of the lid pops up and down, that is not sealed. You can store that jar in your fridge to use soon. Once the jars are cool, it’s a good idea to label them with the date. Try to use them up within one year for best results – I just turned last year’s last few jars into lovely spaghetti sauce for a party of friends. When you do go to use them, it’s worth it to strain the tomatoes but reserve the liquid, just in case you need to add it back into a thick sauce. It is easier to add liquid than remove it! Please post your reactions, questions, comments, or concerns. Do you can tomatoes at home? What methods do you prefer? ← A Poltergeist in my Booze Cabinet!